JNN 02 Jan 2014 QUETTA: Two people were Martyred and 31 others injured on Wednesday as a powerful bomb blast targeted a passenger bus carrying Shia pilgrims from Taftan, a town in Balochistan bordering with Iran. 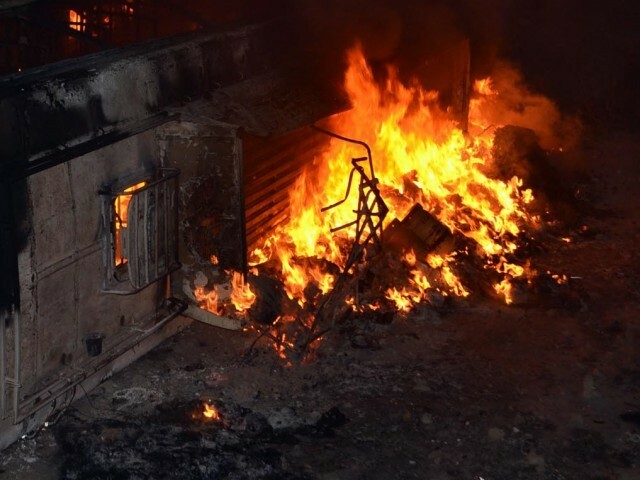 Capital City police officer Abdul Razzaq Cheema confirmed that the blast, which occurred near Qambrani Road in Akhtarabad, was a suicide attack. He told AFP the bus was carrying at least 46 Shia pilgrims from Iran to Quetta. “Two Shia pilgrims have Been Martyred in the blast while six police men are among 31 injured people,” Our Correspondent Reported . Police and personnel of Anti Terrorism force were escorting the bus when it blew up. “Two police mobiles were in front and two behind, escorting the passenger bus. Two police vehicles passed by and the car rammed into the bus causing a huge explosion,” Cheema said, quoting SHO Raz Mohammed, who was escorting the bus. As rescue services continue, casaulties are feared to rise further. “The passengers were coming from Iran after pilgrimage and most of them belonged to Shia sect which suggests that it is a sectarian attack,” a senior police officer said. Alll the Pilgrim of the Bus Belongs to Bhakkar ,D.I. Khan , Punjab. An Emergency No 081 2661608 has also been given by the Administration for the Inquiry of the Injured and Martyred in the Akhtarabad , Suicide Attack . According to Bomb Disposal Squad (BDS), around 80 kilograms explosives were used in the blast. “Suicide bomber used ball bearings and metal pieces,” said a BDA official. Local bomb disposal chief Commander Razzaq, known by one name, told AFP that the car had been blown up by somebody sitting in it. Frontier Corps have cordoned off the area. The tragedy comes as the temperature in Quetta hover around five degrees Celsius. The injured were shifted to Civil Hospital, Bolan Medical Complex teaching Hospital and Combined Military Hospital where a state of emergency was imposed. Security has been beefed up at hospitals, due to fears of a follow-up attack, a common occurrence in Quetta. “Most of the injured have been shifted to three different state-run hospitals of Quetta,” Deputy Inspector General Mobin Ahmed said. Doctors at Civil hospital said they received two dead bodies and ten injured, five of whom were shifted to CMH because of their critical wounds. Eight injured people were shifted to Bolan Medical Complex. “Death toll could rise as some of the injured are in critical condition,” a rescue worker told. Balochistan is rife with militancy, sectarian Terrorism By Wahabi Terrorist is on the Peak, and a regional insurgency waged by separatists. President Mamnoon Hussain and Prime Minister Muhammad Nawaz Sharif have strongly condemned the bomb blast, as have MQM chief Altaf Hussain and ANP leader Asfandyar Wali. The Shia political party Majlis-e-Wahdatul Muslimeen has announced a three-day period of mourning over the incident. MWM leader Allama Nasir Abbas Jaffri said any kind of progress was impossible if the perpetrators behind such terror attacks were never caught. Chief Minister Balochistan Dr Abdul Malik Baloch ordered that the victims be extended every possible assistance. This entry was posted in Asia Pacific, Pakistan News and tagged Abdul Razzaq Cheema, Allama Nasir Abbas Jaffri, Anti Terrorist Force Men Injured, Balochistan, Balochistan Pakistan, Bus, Capital City police officer, iran, Nawaz Sharif, passenger bus, President Mamnoon Hussain, Prime Minister Muhammad Nawaz Sharif, Quetta, sectarian attack, senior police officer, shia, Shia Islam, Shia Pilgrims, Suicide attack, Wahabi Terrorist. Bookmark the permalink.